Marcus Roberts once described his approach to music as “this interest in a combination of extreme dignity, virtuosity and musical integrity, but mixed with this human feeling that might cover...thousands of years.” Maybe I should let him write his own review as this statement perfectly sums the artistry of his trio’s first set at the Dakota Jazz Club last Wednesday night. In a way, this was a reprise of a stunning evening of solo piano that Roberts presented at the Dakota last May—an equally wide ranging setlist covering much of the history of jazz, from Fats Waller to Irving Berlin, from George Gershwin to Cole Porter, from Tadd Dameron to Charles Mingus, Herbie Hancock and Ahmad Jamal. Yet even this diversity is misleading as no tune was presented in a solitary style, be it stride, swing or an edgy post bop. Rather, jazz scholar Roberts manages to infuse this history of jazz into every note, every phrase, and you’re never sure where on that timeline he will land next. 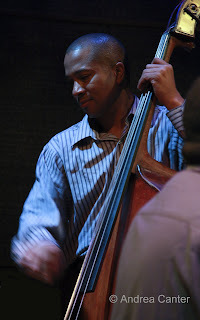 And with long-time cohorts Roland Guerin on upright bass and Jason Marsalis on the trapset, virtuosity abounds but tempered with storytellers’ purpose, probing curiosity, and a collaborative spirit. 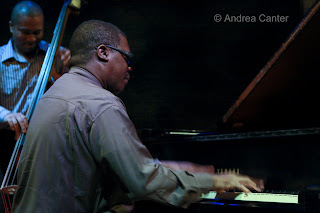 Like the best of the long-term piano trios—Bill Evans, Oscar Peterson, Keith Jarrett, Brad Mehldau, the Marcus Roberts Trio defines empathetic communication, and here that means a seamless transition from phrase to phrase, idea to idea, even from one style to another in the mere blink of an ear. “Blue Skies” constantly changed shape, from a slow and dark overture to the more familiar swing, then rising thunderheads as Roberts percussively attacked on the bridge, then closing like a film noir soundtrack. Fats Waller’s “Ain’t Misbehavin” was given a 21st century facelift with shifting rhythms and dramatic voicings while the original stride foundation was never obscured. 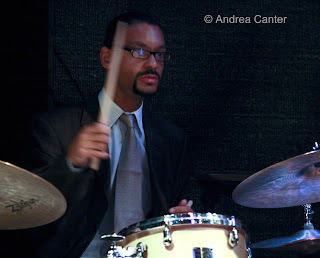 Roberts led with restraint on Tadd Dameron’s “Lady Bird,” starting out sweetly as if expecting a vocalist to come onto the stage at any moment before shifting into more energetic improvisations, even a brief quote of “Take the A-Train” as the trio appeared to create a new arrangement on the spot. Shining throughout, Jason Marsalis was at his best in counterpoint to Roberts on “Lady Bird,” emulating a tap dancer with his quick staccato fills. Roland Guerin was featured (appropriately) on Charles Mingus’ “Haitian Fight Song” with extended opening and closing solos, bringing a new twist to the idea of “slap bass” as his thumb snapped against the wood like a second percussionist. And Marcus Roberts seemed to pick up where he left off last May despite his highly accomplished cohorts, providing an often dazzling display, always in artistic command of whatever composition was presented, his big hands swallowing the keyboard in an explosion of chords one minute, delicately etching single notes the next, calling up stride as elegantly and (seemingly) effortlessly as a bebop frenzy. His one solo of the evening, “Someone to Watch Over Me,” was filled with articulate embellishments, but even more striking was his nearly invisible movement from ballad to rhapsody to swing to ballad, all styles merging in one familiar melody.